This photo was taken during a Bar Mitzvah at Woodfield Country Club in Boca Raton. 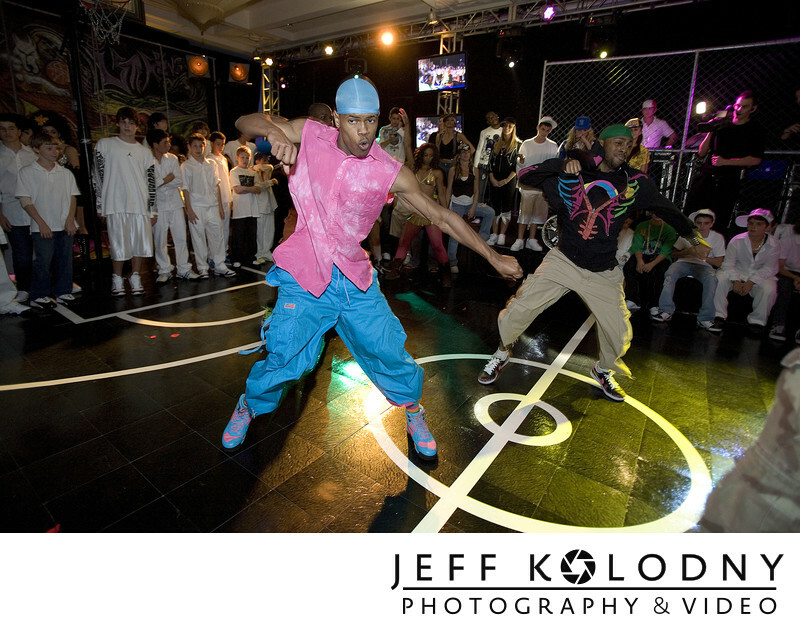 The theme for this party was New York City street action. The decor consisted of a basketball court surrounded by a chainlink fence as well as a NYC style subway booth. During the party they has several dancers who's job was to get the guests dancing. Before the dancers invited the guests to dance the dancers put on a little show. There were both male and female dancers and they had a choreographed dance routine. I shot this using a Nikon camera and an on camera flash. The flash exposed for the dancers and I set the shutter speed and aperture for the background. Woodfield Country Club is a fantastic place for weddings and other events such as Bat & Bar Mitzvahs, Birthday Parties and others functions. Whether you dream of a traditional religious ceremony, a romantic outdoor affair or a fun-filled reception, Woodfield Country Club will help make your dream event a reality. Surrounded by beauty and luxury, and paired with infinite catering options and impeccable service, Woodfield is the ideal setting for your special day. On of my favorite things about Woodfield Country Club is the large ballroom along with a beautiful lobby. If you are looking for a place to hold a beautiful wedding or bar / bat mitzvah then Woodfield Country Club should be on your list as a venue to check out. Location: 3650 Club Place, Boca Raton, FL 33496.